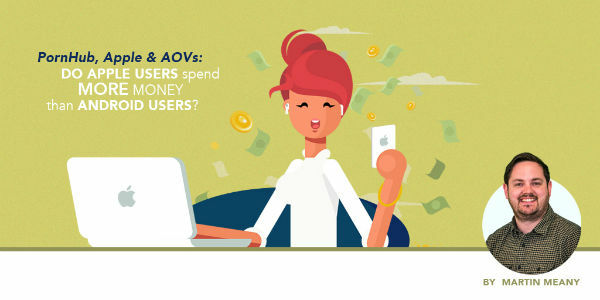 PornHub, Apple and AOVs: Do Apple Users Spend More Money Than Android Users? PornHub, iPhone users and e-commerce. I bet you I can make a connection between these that will make your business more money. Years ago, when I started working in online, I came across anecdotal evidence that people browsing the web on Apple devices spend more money than other internet users. I was told that a website had raised prices but only for people browsing on Apple devices. Conversion rates didn’t drop as the website raked in extra revenue. The test was fueled by an idea that Apple devices provide the same as many others on the market, but cost more money. Hence, people who use Apple devices are willing to spend more - a debate we won’t be going into today. Fast-forward a few years and I’m looking at some content on PornHub. Before you go getting any ideas, I’m on about the amazing insights content they create using anonymous user data from their site They provide topical and usually hilarious insights into the people who browse their site. One of their recent blog posts looked at the impact Apple's iPhone launch event had on PornHub's site traffic. Sure enough, they saw a 12% drop in visitors from mobile iOS and an 8% drop in desktop MacOS traffic. By the way, that’s a SFW link but the site branding might turn some heads in the office - open with caution. PornHub’s creation of data-driven content got me thinking about the data available to me and the plethora of digital marketing questions that it could answer with it. With the iPhone 8 just after launching, we still have to wait for the iPhone X - Apple's new mega-flagship. The iPhone X will be the most expensive iPhone of all time, weighing in at a cool €1180. That’s €200 more than the next most expensive “mainstream” smartphone; the Samsung Galaxy Note8 which costs €980. Following our 2017 E-commerce KPI Benchmarks Study, we had plenty of data at our disposal. To test this hypothesis, we looked at 31 million Android and iPhone mobile sessions which generated almost one million transactions over a 12 month period. Alongside the operating system, we extracted Average Order Value to see if mobile iOS traffic (read iPhone) spends more money than Android traffic. The results were astonishing. People browsing e-commerce websites on an Android-powered mobile device spend an average of €9.69 per transaction. Apple visitors to these same sites spend an average of €27.66 per transaction. That means iPhone users are spending a whopping 185% more than Android users. While that’s a cool little nugget of information, it’s also incredibly actionable. With the knowledge that mobile iOS traffic is likely to spend more money, how can you target these people? Facebook is your most powerful ally here as the platform offers the option to choose specific mobile devices and operating systems. You can easily target the big spending Apple users by selecting ‘iOS Devices Only’ in advanced options. 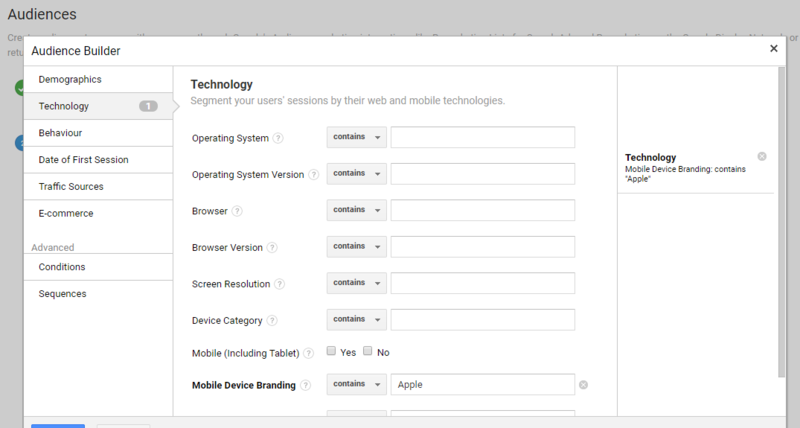 In AdWords, you can limit which operating system both Display Campaigns and Video Campaigns appear on. There is no such option for Search, but not all hope is lost. Through Google Analytics, you can build an audience based on operating system. You can then target this operating system-based audience with specific campaigns and ad texts, optimising your bids on Search, Display and GSPs. Apple users are indeed likely to part with more cash than Android users. Far from a throwaway statistic, if you’re looking to increase your Average Order Values, tweaking your targeting and optimising your bids by operating system through both AdWords and Facebook will see you reap significant rewards.